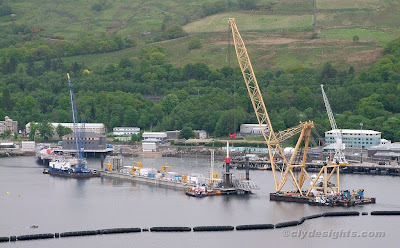 Now firmly secured in place by four massive guide piles, the new facility at Faslane is taking shape in readiness for the arrival of the first of the 'Astute' class submarines, currently under construction at Barrow-in-Furness. Driving the fourth, and last, pile into the seabed was being carried out by TAKLIFT 7, seen with her supporting vessel EERLAND 26 alongside. At the other end of the jetty is the Dutch crane barge DINA-M, on her second visit to the submarine base. Having seen the piles being brought up, it's incredible to see how far they've been driven in now. At high tide, it looks like only about a quarter of the length of each of them will be showing!